Beach wedding ideas can be the perfect alternative to the traditional wedding. If you are looking for a laid-back, fun-in-the-sun wedding, you may be a perfect candidate for a beach wedding. Although summer is the time of year when most people think of having a beach wedding, they can be held in warm locations in any season. There are many great possible locations for beach wedding ideas. Living on or near the beach obviously makes choosing a location a little bit easier. If you do live near the beach, look for restaurants or resorts on the beach as reception locations. Many locations offer breathtaking views of the beach, and some will even let you exchange vows in the sand. Am I allowed to have my ceremony on the beach? Will my wedding be the only wedding that day? Do you have rooms for out of town guests or hotels nearby? Can I have reception outside with the beach as a backdrop? Even if you don't live near a beach, you can still have a destination beach wedding. Possible locations for a destination beach wedding include resorts in Florida and other southern U.S. states, California, Hawaii, Europe and the Caribbean. More ideas for your wedding ceremony can be found at beach wedding ceremony. Start your beach-theme wedding off in style with tropical wedding invitations. Visit our Beach Wedding Invitations page for ideas. There are several unique options when choosing beach wedding favors. Visit our beach wedding favors page for some ideas. Beach weddings are typically more relaxed than the traditional wedding, and most beach wedding brides wear simple, elegant dresses. This doesn't mean, however, that you can not wear a more formal gown. Just make sure the style of dress you wear matches the mood and ambiance of your beach wedding. Typical beach wedding dresses are strapless, halter or have spaghetti straps. Instead of a veil, you may choose to have your stylist add tropical flowers to your hair. For bridesmaid dresses, brighter colors usually work best. Try tying in a color in the dresses that matches your flowers, like red for example. For the groom and groomsmen, light colored linen suits are a nice option paired with a white button down shirt and sandals. 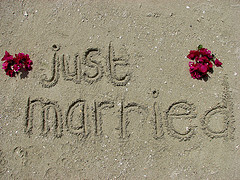 More information can be found on our beach casual wedding dress, tropical wedding dress and beach wedding shoes pages. There are several beach wedding ideas for flowers that can brighten up your wedding. Birds of paradise are a tropical flower that can be used instead of traditional bouquets for the bridesmaids and in flower arrangements at the reception. Another fun idea is floral leis for the bridal party and as favors for your guests. If you are ambitious enough you can make them yourself using button chrysanthemums, orchids, glass beads and thread. Your florist can also help you with making leis, and there are several websites that ship them right to your door. For more flower information visit our tropical wedding flowers page. A signature drink is a fun, classy addition to you beach wedding. There are many options including Mojitos, Margaritas, Mai Tais and Martinis. Work with your caterer or reception space to see what your options are, and don’t forget to taste test each of them before picking one! Visit wedding signature drinks for more ideas. And don't forget the Mini Cocktail Umbrellas ! The perfect way to finish off your tropical wedding. Read our seven beach wedding ideas for a tropical wedding cake. Hawaiian wedding cakes are another fun option for your beach wedding. Of course you can always go with a DJ as your entertainment. However, there are beach wedding ideas that allow you to get a little more creative if you so choose. For example, instead of a traditional band consider having a Calypso, Steel Drum, Reggae, Salsa/Merengue or other tropical-themed band for cocktail hour and/or your reception. Some may argue that there is no better location for a beach wedding than Hawaii, and they are probably right. Visit our traditional Hawaiian Wedding Ideas guide. Closely related to beach weddings are nautical weddings. Visit our nautical wedding ideas guide for tips and information. Choose a Costa Rica Wedding Destination for a tropical wedding to remember.